The students of Dover Youth to Youth are highly sought after to provide conference workshops, youth advocacy training to local groups, and presentations to general audiences in schools. History of Lies (tobacco prevention) presentation: charts over 100 years of tobacco industry deception and lies. Eight Things about Alcohol: This presentation contrasts alcohol advertising against the actual consequences of underage drinking. Samantha Skunk Presentations: Costume characters and puppets are used to tell a story to elementary aged audiences. Storyline can emphasize medicine safety, smoking, or lung health and exercise. Each year representatives from different communities from around New England come to our facility and review our materials and discuss how our program is implemented. If scheduled strategically, that can often include meeting with some of our student leaders. This resource is typically requested by those that are in the getting started stage or in the “checking it out” stage of the process – trying to decide if this our approach is something that would work for them. This is always available to representatives of other communities or organizations, and there is no charge. There is no charge for discussion and questions over the phone. It is particularly expected for those trying to implement any of our materials or programs; those who have purchased a Toolkit, or those trying to figure out which services of ours might be best suited for them. This is a short but structured presentation conducted by 2-3 youth and one staff person. It covers the basic design/strategy of our youth empowerment approach and illustrates examples of the kind of activities our students engage in (media, policy change, presentations, community awareness activities). It is typically 15-20 minutes plus some time for questions (can be longer on request but this is usually for an audience that wants a concise executive summary). It is designed for key school or community leaders who are critical to the success of implementing your youth empowerment program. Typical attendees often include school administrators, town officials, key coalition members, prospective advisers, potential student leaders if identified, police and others involved in drug prevention, and any other person whose buy-in is important to the success of your potential program. This is a high energy multi-media presentation designed to be delivered to a general school population – usually where the school/community has made the decision to implement a youth empowerment group and now wants to show potential members what the program is like in order to encourage youth to sign up. It is taught by 5-7 trained student members of our program. The Road Show is longer than the “Primer” presentation described above and can be designed to fit into a typical school period. 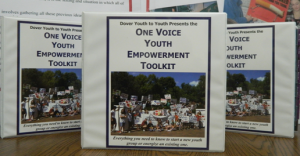 It includes a description of how Youth to Youth works in Dover, an educational block on either underage drinking or tobacco, a block where our students explain what they have done to take action, and concludes by encouraging the audience to sign up for the new program in their school. It is appropriate for grades 5 – 12 but is rarely requested for higher than grade 9 since most schools want to start by recruiting younger students (so they are around for a while). It is most often requested for students late in grade 5 or early in grades 6 and 7. It should be delivered to the grade you want to draw your new members from. Advocacy Skills 101: 20-minute agenda block. Often used to “kick off” a training block. Overview of activism and advocacy in a youth advocacy context. Advocacy Skills 102: Used for groups that anticipate using students in large group advocacy initiatives. Teaches skills such as creating posters & visuals, developing chants, cold contact of pedestrians, palm card development, and planning issues (safety, supervision, youth leaders, permits, and logistics). For more information – go to the Activism & Advocacy page of this web site. Presentation Skills 101: Teaches techniques that develop the 4 core elements of effective public speaking (projection, speed control, vocal animation, physical animation). Highly interactive and includes exercises by breakout groups followed by application of the skills to actual prevention media and material. Performing Short Skits & PSAs: Students are taught to deliver theatrical skits or radio/video PSAs using our established scripts. Gives students the experience of performing the media without the pressure to think of something original. Developing Media: Employs a nine-step process to teach youth how to develop original media such as a radio spot. Includes instruction, exercises, and break out groups – with a goal to develop 2 or more original drafts or near-finish concepts. Working with the Press: Teaches students the key aspects of dealing with the press: creating a media advisory, writing a press release, delivering a press release, setting up a press conference, preparing to be interviewed by a reporter, common question types to expect. Includes interactive simulations taken from real prevention based press conferences. Policy Change for Youth Advocates: Overview of the range of types of policy change advocates can engage in. Includes actual examples as illustrations of the kinds of situations where policy change can be attempted, such as: school policy, business practices, media content, and local & state law. How to present the “8 Things” underage drinking presentation: Teaching your advocates how to present this presentation – to late middle school or early high school students. This presentation that contrasts alcohol advertising against the actual consequences of underage drinking. How to perform the “Samantha Skunk” medicine safety early elementary (pre-K to 1) presentation: Uses costume characters. This is a great presentation for getting your young advocates used to the idea of teaching in front of an audience. How to perform “History of Lies” (tobacco presentation): teaching your advocates to teach this presentation which charts over 100 years of tobacco industry deception and lies. How to present “Pop Culture Influences on Underage Drinking”: Highly visual media intensive presentation designed for parent/adult audiences. Your advocates can be taught to present how popular culture (movies, TV, music, toys, clothing, video games, etc.) sends positive pro-drinking messages to youth and what can be done to counter those messages. Advocacy training for adult advisers / staff: Designed on request. Content is based on the advisers’ experience and training needs.